Four men with White House ambitions spoke to about 300 Iowa Democrats in Des Moines tonight, offering glimpses of the 2020 Iowa Caucus campaign conversation. California Congressman Eric Swalwell has been a frequent Iowa visitor and made clear he’s considering a run for president. Swalwell argued Democrats must abandon incrementalism. Pete Buttigieg, the mayor of South Bend, Indiana, also argued Democrats must embrace “boldness” to counter President Trump. Oregon Senator Jeff Merkley said America can afford “Medicare for All” and take steps to get all its energy from “clean, renewable” sources. Andrew Yang, a New York businessman, is the only one of the four who is an officially declared candidate for president, with paid staff already working in Iowa. 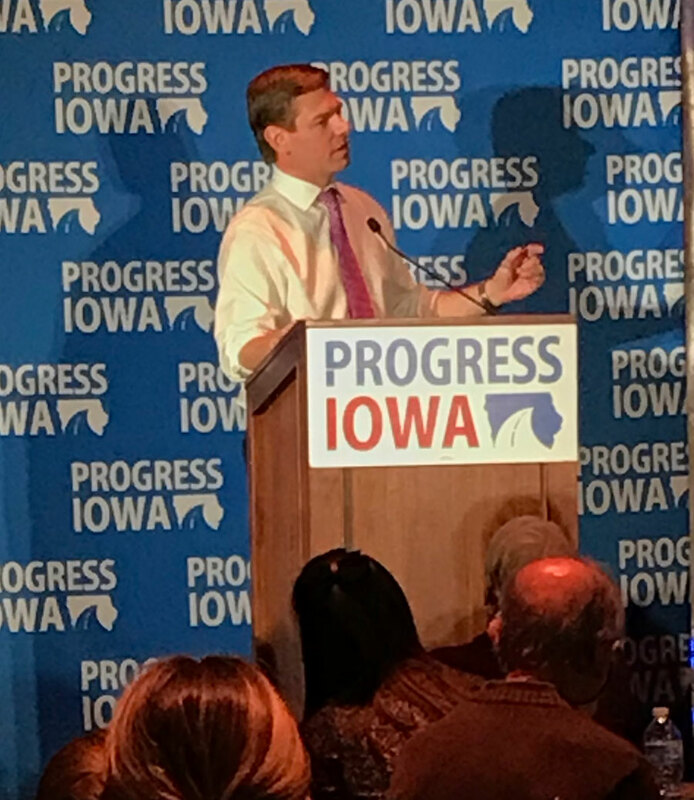 Tonight’s event was an annual holiday party organized by “Progress Iowa” and the group kicked things off with speeches from the two Democrats who will be the first women to representing Iowa in congress. Cindy Axne of West Des Moines, the congresswoman-elect in Iowa’s third district, mentioned the looming fight over the Affordable Care Act. “I will do everything I can to make sure that we never go back to the time when people with pre-existing conditions are denied coverage or have to pay more,” she said, to applause. Abby Finkenauer of Dubuque, the congresswoman-elect in Iowa’s first district, used the end of her brief speech to focus on the next election. “2018 may have been the year we got back up, but we have so much work left to do, taking back that state house, that state senate, flipping a US senate seat and taking back that White House,” Finkenauer said. Finkenauer and Axne will be sworn into office on January 3, 2019. The Iowa Caucuses are scheduled for February 2, 2020.